Fear Blocks (Part 1): Are Your Limiting Beliefs Holding You Back? 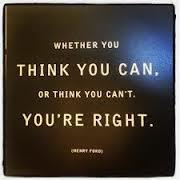 Beliefs are thoughts that you accept as true. They can either help you or hinder your life, relationships, and career. A friend of mine wakes up every morning, looks himself in the mirror and says, “You are handsome and successful.” And he is. He has a beautiful home, a very successful career, and a loving wife. 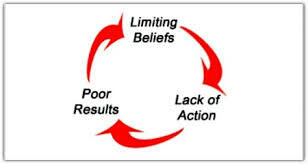 Limiting beliefs hold you back from achieving and/or enjoying the success you deserve. They can be general beliefs about the world, your environment, the people in your life, and situations you find yourself engaged in. More often than not, you accept a limiting belief as true because you’ve learned it from someone else, or from an “authority,” such as the media, a parent or loved one, a book, or even a movie. You assume that you’ll never have that big house, get that promotion, or have a great relationship because, well, it’s just the way it is. But someone has a great career, home, and relationship. Why not you? extremely dangerous even to attempt it. Yet on May 6 of that year, Roger Bannister crossed the finish line in 3 minutes and 59.4 seconds, thereby disproving the myth forever. 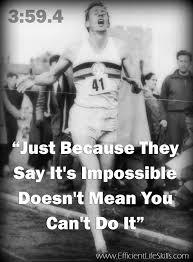 What others saw as a limitation, Roger Bannister perceived as opportunity. And once he disproved the presumed limits of the human body, less than two months later, another runner, John Landy, broke Bannister’s record with a mile dash of 3 minutes and 57.9 seconds. If it’s true t hat beliefs are only a collection of thoughts that you accept as true, is it possible to accept a new set of thoughts, thereby creating new empowering set of beliefs? Ones that will help you to achieve the success you dream about? I challenge you to do just that for one week. Let us know your thoughts and if you think someone else could benefit from this information…Share!